Whoa! 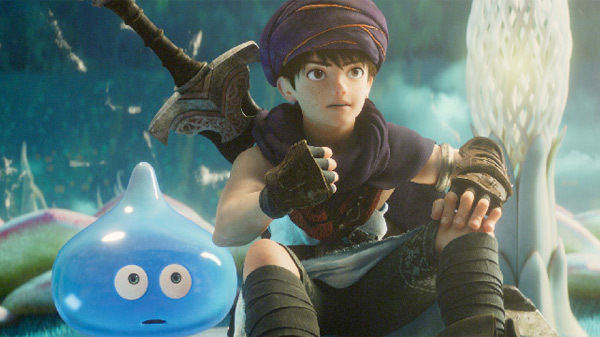 Toho Co. in Japan has debuted the first official trailer for a new Japanese 3D animated feature film titled Dragon Quest: Your Story, based on the popular video game series of the same name. For those in America, this game was released under the title Dragon Warrior, and the first version of it was released for the NES back in the 1980s. Maybe you remember playing it? The series has since continued and is currently up to Dragon Quest XI. This film pulls its story from Dragon Quest V: Hand of the Heavenly Bride - the fifth instalment in the series, released on the Super Famicom in 1992 and re-released on the Nintendo DS in 2008. Featuring the voices of Kasumi Arimura, Kentaro Sakaguchi, Takeru Satoh, and Takayuki Yamada. Looks action-packed and wildly entertaining. As a fan of the old game, I can't help but be curious. A feature film based on the Dragon Quest video game series. Dragon Quest: Your Story is written and directed by prolific Japanese filmmaker Takashi Yamazaki, of many films including Juvenile, Returner, Always - Sunset on Third Street, Ballad, Space Battleship Yamato, Friends: Naki on the Monster Island, The Fighter Pilot, Stand by Me Doraemon, Parasyte: Part 1 & 2, Fueled: The Man They Called 'Pirate', and Destiny: The Tale of Kamakura previously. Based on the video game series published by Square Enix, first released in 1986 for the original NES. Featuring music composed by Kouichi Sugiyama. Dragon Quest: Your Story will be released in theaters in Japan by Toho starting August 2nd, 2019 later this summer. No other international release dates have been announced yet - stay tuned for updates. First impression? Thoughts?